The last two winters have seen two separate friends have twin boys. This winter, there are two more babies coming, but to two different friends, and they’re both girls! My cousin is due with her first baby in January and then our good friends Sam and Carmen (for whom I knit these mittens way back when) are expecting their first baby in February. Both of those babies aren’t due for a while, but since Christmas is coming, starting some baby sweaters now just made sense. First up, another Sunnyside! I’ve knit this twice now, and I’m pretty sure I’ll knit it again. I’m knitting this pretty much as written, but with all the cables mirrored — mirrored across the button bands and down the raglan lines. I also miscounted when I started doing the second cable, so these are a little tighter than written (every six rounds rather than every eight), which makes them a bit ropier. 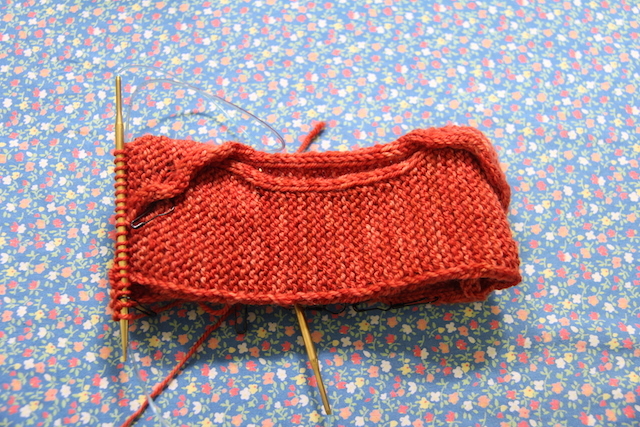 I’m also knitting a wee Envelop, which is one of the most fun and clever patterns I’ve ever knit. It’s nothing crazy, but it’s fun to watch it all come together. I’m just about to knit the right arm, but I’m debating about the size. Despite going up in yarn weight (I’m using DK instead of sport-weight) and needle size, my gauge is smaller than the pattern’s. 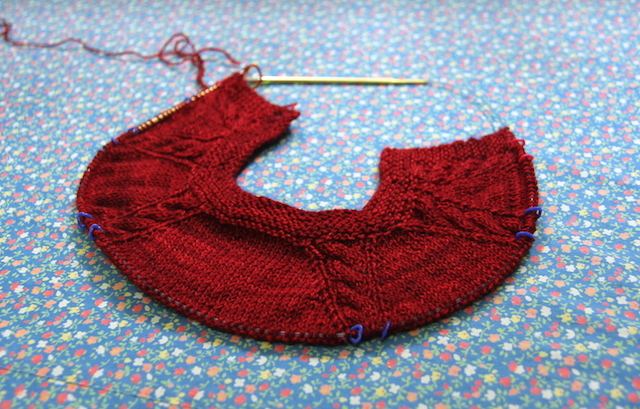 I added some extra rows to the yoke area, but right now, pre-blocking, the chest circumference is about 16 inches. I’m planning this for a newborn, so that seems like it should be big enough, but I’m not sure and don’t have a baby nearby to measure — what do you think? Keep going or rip back and reknit on a larger needle? When I planned these projects, I didn’t know that both my cousin and our friends were expecting girls, so I planned for unisex garments. These are both first babies, so I think it makes sense to make things that can get used again. Really, though, I just love both of these colours for babies. They may not be traditional baby colours, but I like rich colours on babies, and that red is really gorgeous. The orange is for our friends, and it’s one of their favourite colours, so it was an easy choice. I suspect there will be more little knits on my needles before these babies are born, so please let me know your favourite patterns for new babies. 18″ circumference is about a 0-3 month size, so 16″ should be fine as long as the babies aren’t on the large side. 🙂 If the sweater grows a bit, that’s even better since newborns outgrow clothing soooo quickly! Love your baby wips, Envelope especially! Oh those are adorable! I recently gave a gift of a baby sweater – it’s so cute to see little ones in handknits! I absolutely love these colors you picked for the babies. So versatile and rich! I fully believe there is nothing cuter in the world than handknit baby clothes 🙂 I actually love reds and oranges and greens much more on babies than traditional baby colors. Your friends will be thrilled!